I typed and typed the second half of the Felix story and it disappeared. I'm too frustrated with it to continue at the moment, but I will get back to it. 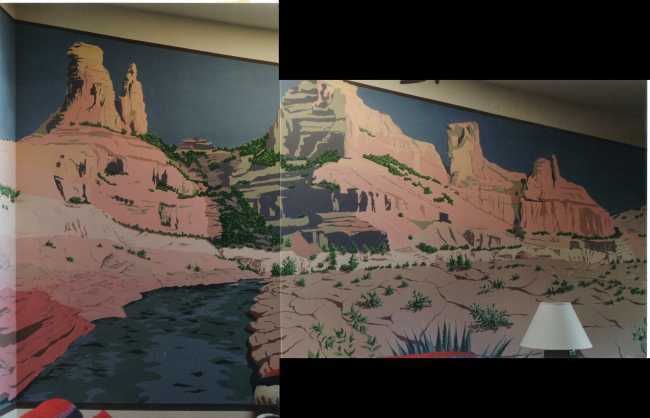 Here are two murals. This first one was made in 1994 in the house of Mark Nobile the Manager of the Harrisburg East Mall. 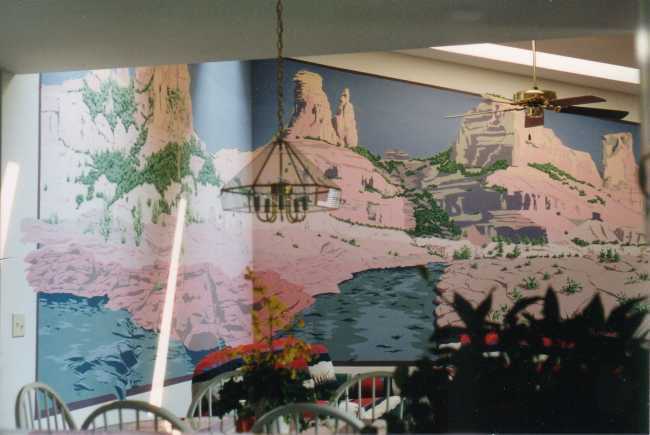 I also painted 4 other large murals in the mall that year, all of which were destroyed within 2 months of completion, and none of which I got photos of. A testament to the energy and stupidity of youth. This mural is large. The high end of the room is 16 feet. The photos are not very good (this was before digital cameras) and I've spliced some together as best I could. I spent 6 weeks on this and received $600. Ha Ha. More testimony. This is the East and South wall view. 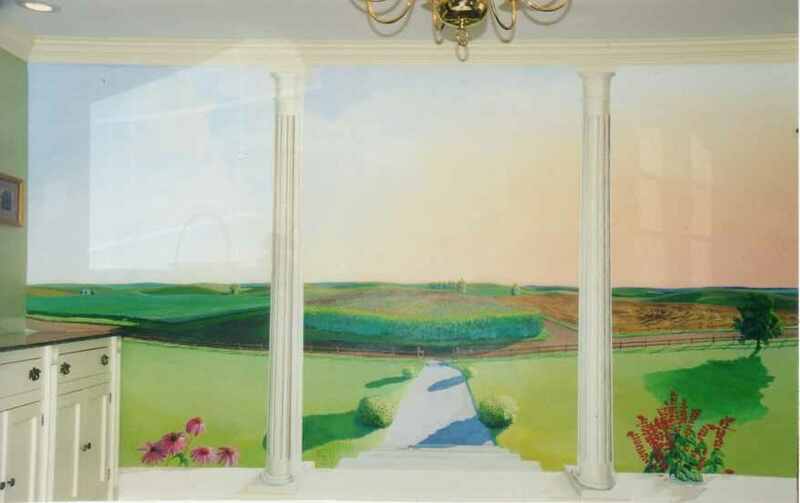 This mural was done in 2000 in Barbie Buchanan's dining room, deep in Farmland, IL. Once again, the photos are terrible. Barbie had me repaint the sky 3 or 4 times, a laborious and frantic blending process using white paint, powder pigment, and a spray bottle. At the time, I was frustrated, but the end result was well worth it. If you've ever been in the prairies in late July, you will recognize this humid sunset glow. I very carefully painted the exoskeleton of a cicada and posed it amid the exquisite china in this cabinet, which, to my knowledge, is still there. These murals are the embodiment of specific requests. 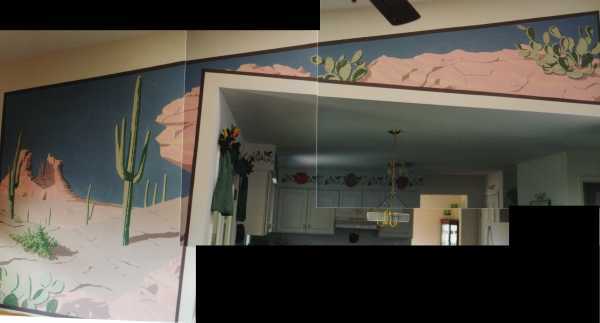 The Koch Kitchen mural on my site is my own whim and design. 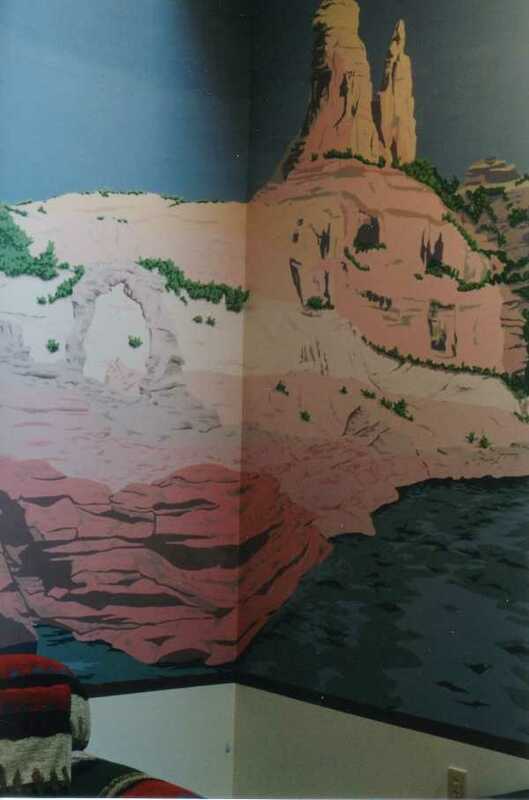 If you'd like your own Michael Benjamin mural and are looking to get a deal like Mark Nobile, approach me like this: "Michael, I think your work is gorgeous! I'd love to have you paint anything on my wall, anything at all! Whatever comes into your head, because you're soo creative." Yes, thank you, do go on, would you like a free one?